Northern Exposure, Day 4: Riga to Vilnius. After our late arrival in Riga and our encounter with the diffident driver last night, we slept in until just before the sumptuous breakfast buffet was destined to shut down at 10:30. After gorging ourselves on the feast, we found a competent taxi driver who delivered us straight to the airport with no confusion—at least none until we asked him to drop us at the Hertz rental building which was about 200 yards from the main terminal. He was not an English speaker, and our complete lack of facility with Lithuanian meant we walked in the misty rain from the terminal to the auto office. Friendly and quite fluent in English, the Hertz agent got our rental sorted out efficiently and summoned a Park and Ride van to shuttle us to the rental car parking lot and our Opel Astra. The daredevil van driver wheeled around curves with reckless abandon, screeching to a stop before lurching away again at breakneck speed. With no seatbelts, we were hanging on to the seat backs for dear life until we escaped the van and were safely on our way with a calmer driver at the wheel of our rental car. Midday traffic was heavier than we expected as we left the airport area and crawled in bumper-to-bumper congestion for the first half hour. Finally about 1 p.m. we escaped the bonds of city snarls and embraced the freedom of the open road. 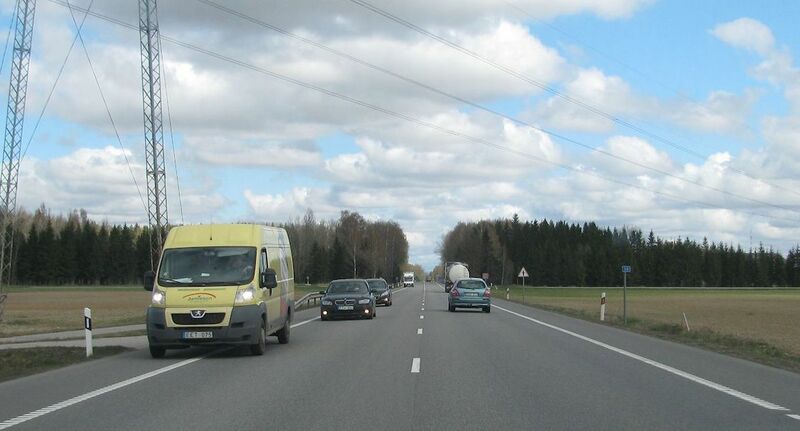 Traveling on the two-lane A7, a national road connecting Riga to the Lithuanian border, we soon realized why the road was bordered by extra wide paved shoulders. Rather than fitting two-lane roads with occasional passing lanes (or overtaking, as it's called in Europe), Latvia equipped at least some of its roads with hard surface shoulders about half the width of a traffic lane. This enables slower drivers to move over (like the yellow van in the photo above) to allow speedier drivers to pass. Ideally vehicles traveling in the opposite direction also move over to the half lane so the passing car can move past without danger of collision. We observed it used frequently and thought it was perfectly effective and much safer than a normal two-lane highway without the extra width. About fifty miles south of Riga, we reached one of Latvia's most famous sites. Sometimes called the Versailles of Latvia, Rundāle Palace is a monument to aristocratic excess and ostentation. The lavish estate was originally built as the summer residence of the Russian Dukes of Courland, who traveled to their country place from Saint Petersburg. Situated between two rivers, the palace has become a major Latvian tourist attraction and still serves occasionally as accommodations for visiting dignitaries. Construction of this extravagant vacation home was funded by Emperor Anna of Russia as a gift for her court favorite Ernst Johann von Biron who had wheedled his way into the Courland title. Upon Anna's death, Ernst fell out of favor and was seized for involuntary transport to Siberia by his jealous rivals in the court. The palace stood empty and unfinished for 22 years while von Biron cooled his heels in exile until the next change of power saw him restored to favor and he was able to complete his project just four years before his death at age 82. The Duke's ornate throne room was once used for storing grain. The palace subsequently fell into the hands of a succession of Russian nobles and served at various times as a hospital by the invading or occupying forces—Napoleon's army in 1812 and the Germans during World War I. After the Latvian War of Independence in 1919, the palace came under the supervision of the Ministry of Agriculture and parts of the estate were used as a primary school, residences for military veterans and even a grain warehouse. It continued to be used as a school until 1978 with the duke's dining room serving as the gymnasium. Eventually the palace and its grounds became the focus of a massive restoration project, which was completed in 2014, though work is never ending on an estate this size. It has been operated as a museum since the late 1970s, even as work was ongoing. The most elaborate of the restored rooms were those of the duke's private quarters, ten rooms where he lived his personal life. Most rooms in the palace are equipped with blue delft porcelain stoves which were heated by a fireplace or furnace accessed from behind the walls. The only room we saw with two stoves was the duke's bedroom. Rundāle's baroque gardens and park are no less grand than the palace. Once overgrown and disfigured, they too have undergone extensive renovation in accordance with the original plans. Our visit to the gardens was only superficial as we had many miles yet to travel, but one could easily spend a day or two exploring their many sections. 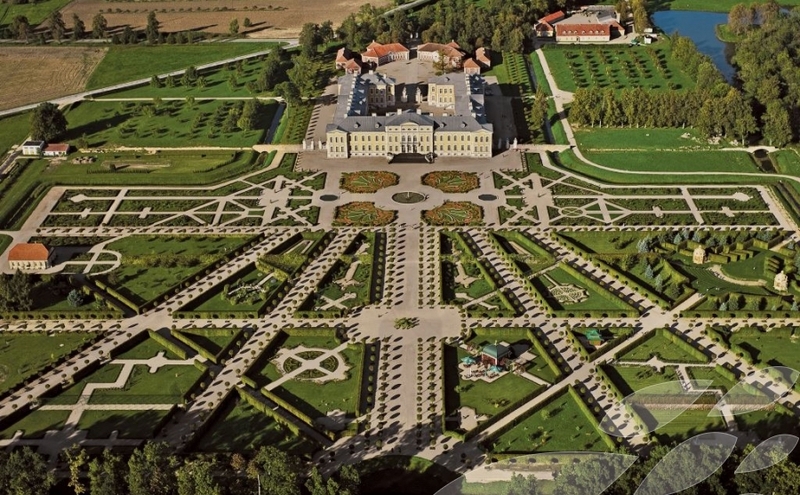 An aerial shot of the estate from www.latvia.travel reveals their extent. Continuing south on A7, we reached the border with Lithuania with no more fanfare than crossing from one U.S. state to another. Since many European nations joined the Schengen Agreement in the 1990s, border control between member nations has largely been abolished. The passport checkpoint building at the Latvia-Lithuania border sits shuttered and unused. Arriving in Vilnius around 7 p.m., we were thankful to find an excellent restaurant at the hotel, simplifying our dinner plans. Tomorrow we'll spend a full day in Vilnius and try to scratch the surface of its many historic attractions. How Long Can You Hold It? We have yet to visit a European country that is equipped with highway rest areas of the type found in the U.S., leaving one to wonder where to pee when you wander. Just as we were about to reach our limits, we were thrilled to see a roadside sign advertising a W.C. ahead—an offer of relief to our overextended bladders. The W.C. in question was inside a little roadside cafe/truckstop. We wondered whether we were obligated to purchase some food in exchange for the potty privilege but were happy to see a sign on the restroom doors explaining the protocol: "30 cents EURO | Free for Truckers." Loved: Being major fans of road trips, we are always delighted to see new ideas that improve life on the road. Between the half-lane passing system and the roadside pee-for-pay idea, we're hard pressed to say which one we loved more. Lacking: An understanding of 24-hour clock time. Unaccustomed to this convention, it takes us a moment or so to figure out what time is being cited. Our plane leaves at 20:20...is that 8 or 10 p.m.? Learned: Despite its advanced age, Vilnius (founded in 1323) has an interesting representation of avant garde architecture. Never thought of using laundry lines for decor but it looked pretty cool in hotel cafe.